"Going back to Watermark, I think we cut ourselves off from the music scene because we felt it would be a negative influence. Our music was very different, and we'd had no success at that stage, so we deliberately didn't seek or want anyone else's opinion. Even now I think if I got caught up in a glitzy entertainment world, my music would suffer. I just feel that I have more to say with my music than by going on a series of talk shows." As it is, she can travel easily almost anywhere in the world without being harassed. "I have remarkable freedom for an artist who sells as much as I do. In Ireland I'm recognized, but usually people just walk up to me and say they like a particular song." She smiles wryly. "There's no Enya -mania, or anything like that." The music is mystical, the singer a mystery -- not what you'd expect from the Artist behind two of the biggest albums of the last decade. But what lies behind the carefully cultivated veil? First, you could develop a distinctive genre of music, quite unlike anything that's been heard before, owing much to hymns and traditional Celtic tunes, with a dash of new age thrown in. You could sing some of it in Gaelic or Latin in a pure, ecclesiastical voice. Irish singer Enya has pursued just this policy -- and it has made her one of the planet's top-selling artists. Her 1988 album, Watermark, has sold 8 million copies worldwide; its successor, 1991's Shepherd Moons, did even better, selling almost 9 million and spending an astonishing 199 weeks on the U.S. Top 200 chart. Sales for her new album, The Memory of Trees, are equally healthy -- six weeks after its release it is already at the 3 million mark, with nearly 400,000 in the United States and the rest mainly in the 14 countries where her other albums went platinum. That makes some 20 million records sold in seven years. These are the sort of statistics that spell "phenomenon" loud and clear. Indeed, the only Irish act to have sold more records than Enya is U2 -- and that Dublin group has been around more than twice as long. Van Morrison may have been the Irish artist chosen to serenade President Clinton on his recent trip to Ireland, but the venerable Morrison does not sell records like Enya. Clearly something remarkable is happening -- and largely it is happening in this southern suburb of Dublin, an affluent coastal resort that is also home to Irish rock aristocrats such as U2's Bono. Here, on a large spread behind security gates, is the home of Enya's producer, engineer and co-arranger Nicky Ryan, his wife, Roma (who is Enya's lyricist), and their two daughters. When Shepherd Moons was released four years ago, there had been a suspicion that Watermark was a one-off fluke, and at the time Enya seemed less assertive and confident; Nicky Ryan sat in on her interviews, and she frequently deferred to him. "I have a lot of opinions about (my success) now," she says. "I read a lot of the mail I get, and it's from people of all different ages, which is strange -- young children, teenagers, married couples, older people. And in a lot of cases, it's people who are so busy with their lifestyle. I know from just being around some of my family how people are used to noise every day -- on the radio and TV, traffic, at their workplaces there's all that noise going about. She stops short of theorizing that her music offers spiritual comfort, or even specific meaning to listeners: "I think there's a sense of spirituality there. But a lot of people will never know what the lyric's about if I'm singing in Gaelic or Latin or Spanish. Yet people can still sense the emotion in a performance. They don't care what the words are about -- they just want to experience the whole song." This much is known about her: She was born Eithne N� Bhraon�in (pronounced Enya Brennan) in County Donegal, in the Gaeltacht (Gaelic-speaking) region of Ireland. She was the fifth of nine children; her father led a dance band, her mother taught music and Enya studied classical piano for six years. Nicky Ryan was managing Clannad, and producing such artists as rock guitarist Gary Moore. When Enya grew tired of feeling marginalized within Clannad and being treated as the kid sister, she left -- and Ryan left with her. For the next six years Enya lived with the Ryans in Dublin, where she practised classical piano, then started composing herself. Roma Ryan sent some of her pieces to film producer David Puttnam, who commissioned Enya to write the score for his 1985 film The Frog Prince. Then she started composing for the BBC television series The Celts. At this point, most of her work was still instrumental, but she and Nicky Ryan were starting to evolve their compositional method, involving multilayered keyboards and vocals. In 1986 Rob Dickins, chairman of Warner Music UK, heard The Celts, an album of Enya's music from the BBC series, and played it at home ceaselessly. He met her by chance at an Irish awards ceremony outside Dublin, declared his admiration -- and promptly signed her. "When I first heard her, I fell for her totally," Dickins remembers. "But I signed her as an artist without any commercial potential at all. When I heard The Celts, I couldn't understand why she sang so little. I thought she had such a beautiful voice. It's rare to find music that actually moves you as it moved me." The haunting melodies and angelic multitracked singing on Watermark made it a hit -- though its success was triggered by the surprising popularity of the infectious track 'Orinoco Flow (Sail Away)', which reached No. 1 on the British and Irish singles charts and No. 24 in the United States. Certainly this working method has paid off, even though Nicky Ryan and Enya admit to fierce arguments. They're an interesting contrast in personal styles -- she serene and charming, he often prickly and impatient. Still, "Enya" is not merely one individual -- in musical terms, it's a trinity that includes the Ryans. "There's three of us working together," Enya admits. "I'm the main performer and I write the melodies and play all the instruments, so I feel it's very much me. But the melody only starts the ball rolling -- the lyrics happen, then the arrangement. I always say 'we' because it's a unique setup, and it's only when I start talking about it that I realize how unique it is." Dickins was asked to visit Ireland and listen to The Memory of Trees last year, at a point when Enya and the Ryans felt it still needed far more work. "I listened and I couldn't understand what they meant," he says. "Most tracks sounded absolutely superb. They were ready." An exception was 'Anywhere Is', which truly was incomplete, and which Enya was on the verge of rejecting from the album. "I told them to work on it because it had the makings of an obvious single," Dickins recalls. His role is acknowledged on Enya's albums, which credit him as executive producer; his name cropped up in the lyrics of 'Orinoco Flow' and a Gaelic dedication to him on The Memory of Trees states the album would not have been possible without him. However odd these relationships may appear, they unquestionably fuel highly evocative music. 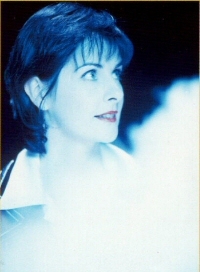 Enya is in demand to score or supply songs for films; her work can be heard on L.A. Story, Green Card, Far and Away and Martin Scorsese's Age of Innocence, among others. And her work elicits deeper responses from her fans than most artists can boast. Scan through the unofficial Enya Web sites on the Internet and you come across some extraordinary contributions. One fan speculates that Enya has pagan beliefs; another, from New Zealand, responds sternly that she is a non-practising Catholic. There is an adoring poem called Ode to Enya and a heartfelt appreciation of 'China Roses', a track from the new album: "Damn near cried in the music store where they were playing it," a fan writes. "Actually, I'm more spiritual than religious," Enya says. "I was raised Catholic, but at this stage I derive from religion what I enjoy. I'll pray -- but I mostly enjoy going into churches when they're empty. It's calming just to sit there. Again, it's like going for a walk. You just seem able to sort your priorities out." Note: Transcribed by Liz and posted to alt.music.enya on January 9, 1996. This article is similar to another by the same author that appeared a few days earlier in the Daily Telegraph.